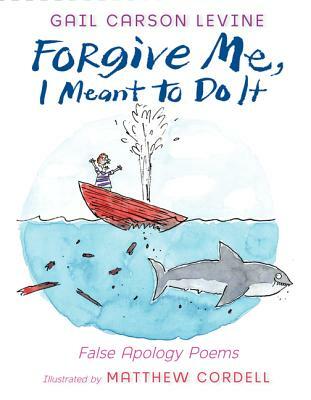 Inspired by William Carlos Williams’s famous poem ”This Is Just to Say,” Newbery Honor author Gail Carson Levine delivers a wickedly funny collection of her own false apology poems, imagining how tricksters really feel about the mischief they make. Matthew Cordell’s clever and playful line art lightheartedly captures the spirit of the poetry. This is the perfect book for anyone who’s ever apologized . . . and not really meant it. Matthew Cordell is the acclaimed author and illustrator of the 2018 Caldecott winner Wolf in the Snow. He is also the author and illustrator of Trouble Gum and the illustrator of If the S in Moose Comes Loose, Toot Toot Zoom!, Mighty Casey, Righty and Lefty, and Toby and the Snowflakes, which was written by his wife. Matthew lives in the suburbs of Chicago with his wife, writer Julie Halpern, and their daughter, Romy.